“Sesang” is the directorial debut of Jules Suo. The film’s title “Sesang” (세상) has multiple meanings in Korean including world, people, life, and social conditions, any or all of which are applicable. 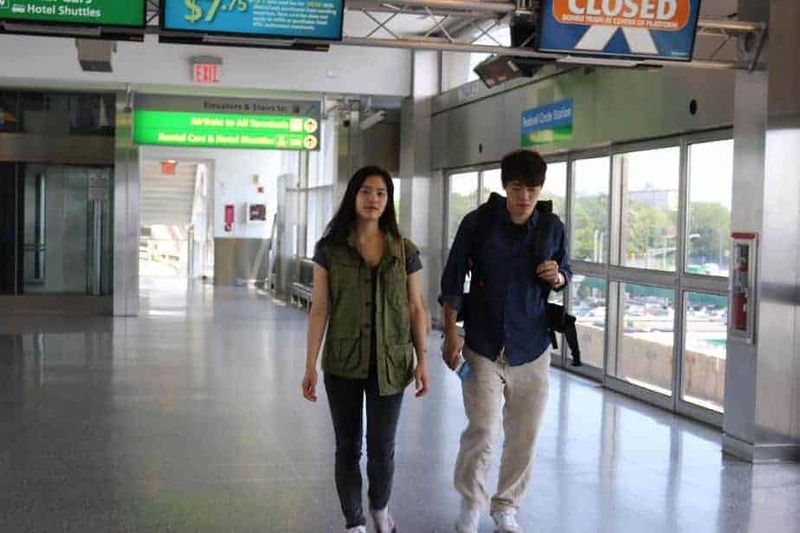 The film is mainly set in New York City and focuses on the diverse experiences of three people living in the heart of the US: Nari (Kim Jin-young), a waitress and actress, Han-chul (Han Jong-hoon), a video editor and documentary filmmaker, and Sergio (Christopher Benitz), a Mexican immigrant, who has been living in the US for eight years. 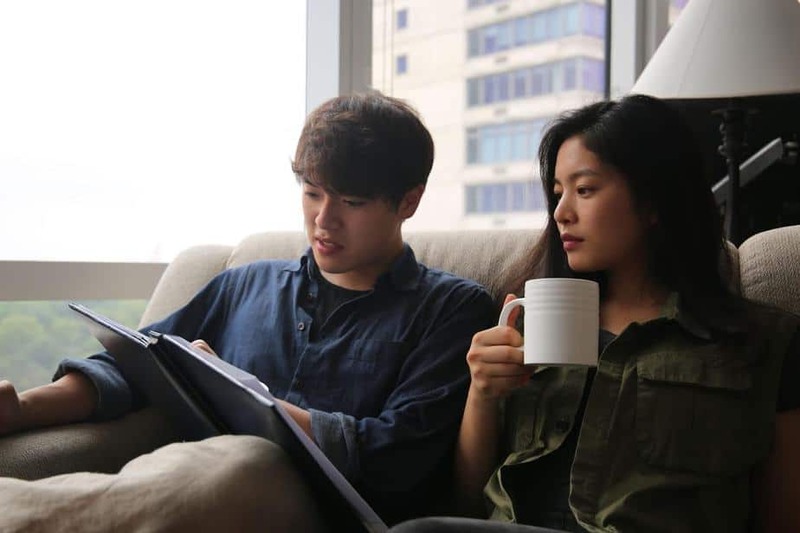 Nari and Han-chul are in a relationship but this breaks down due to Han-chul’s nomadic lifestyle and his concomitant refusal to make long term plans in both his personal and professional life. Sergio drives a taxi for a living in order to send money home to support his mother and younger brother. He lives in a cramped room in an old apartment block. While Han-chul can choose to live an itinerant lifestyle, Sergio has no choice, highlighting both race and class differences as central to constituting the world, and social conditions within that world. Gender is also seen as impacting on one’s conditions of existence, as Nari eventually decides to stop being an actress ostensibly because she falls of her bike and cuts her face. It is a film about existential freedom, new beginnings and dead ends which crosses hemispheres and languages. Independent cinema struggles in South Korea where the emphasis is on well-made genre films or big action blockbusters. Even if independent films manage to get made, they are unlikely to be exhibited. “Sesang” draws our attention to the politics of film-making in its opening scene, set in a theatre where a panel are discussing the difficulties they came across when making their film. The film itself is never named or identified in any way: it could be the documentary that Han-chul worked on or the independent film that we see Nari shooting, or indeed it could be a meta-textual reference to “Sesang” itself. In that “Sesang” is concerned with the art and practice of filmmaking, it situates contemporary cinema as a fundamentally global form. Not only is the film in multiple languages – English, Korean and Spanish – but the fictional films and factual news reportage within the diegesis relate to national issues, including the relationship between North and South Korea, and international issues, documentary footage about the disappearance of 43 trainee teachers from Ayotzinapa in Mexico. The teachers disappeared during a protest about discriminatory hiring practices in 2014 and are now believed to have been murdered by a local drugs gang “Guerros Unidos” (United Warriors). These events appear only tangential to the lives of Nari, Han-chul and Sergio, as none of the characters discuss or engage with the topics directly. However, the personal and the political in “Sesang” are deeply imbricated and therefore the intertextual referencing to wider socio-political issues places the character’s lived experiences as partly determined by factors outside of their control. Identities within the frame are fluid, fractional and fragmentary. This is emphasized by the continual shifts between situations, countries and characters as well as by the use of the back to the camera shot. Such shots deny the mechanics of cinematic identification and force the viewer to perceive the wider implications of the scene. As a result, characters remain mainly ciphers rather than empathetic subjects, except for Sergio who is nearly always framed in medium or close-up. This foregrounds the class difference between the cosmopolitan subject and the immigrant as constituted through choice aligned to agency. This is also communicated through the construction of space and the body within that space. Nari’s contemporary shared apartment is in a direct contrast to Sergio’s cramped studio room, which is purely functional. The free flow of space connotates agency, in opposition to the contracted space in which the subject is imprisoned, by circumstance and class. Sergio’s taxi is another metaphor for imprisonment and is in direct contrast to the repeated shots of airports, train and other interchanges. As an immigrant, Sergio’s freedom of movement is restricted unlike that of Nari and Han-chul who embody the cosmopolitan consciousness and who can transverse both the national and the global without restriction. Jules Suo’s direction and cinematography is minimalist. Using mainly long takes, the emphasis is placed both on the action within the frame and the way in which it is framed rather than on the movement of the camera itself. As such, “Sesang” can be considered as an example of slow cinema which is both reflective and contemplative. Slow cinema is often seen as an act of cultural resistance to the dominance of action orientated films. Suo’s film is more concerned with emphasizing relations between people, than actions that happen in those spaces where people are. Actions in the film are ordinary rather than extraordinary. The camera is almost distracted in some scenes, capturing part of the space, while detailing ordinary actions such as cleaning and cooking. Music is also minimalistic, utilized mainly to signal shifts in action and focus, in order not to distract from the onscreen events. The directorial debut by Jules Suo is an intricate and absorbing reflection on contemporary subjectivity caught between the local and the global and the social conditions which structure that subjectivity especially in class terms. “Sesang” is a political film in the sense that human interactions are placed within the larger framework of global affairs and the viewer is required to work to understand the interrelation between the two. Nomadism is the privilege of the middle classes, it is a doctrine of emptiness and those that choose it see it is as freedom from capitalistic consumerism, while those that are nomads by circumstance are trapped by it. We are meant, in the final analysis, to reflect on our relations with those around us, and especially those who don’t have the freedom of reflection that we have. We live in politically difficult times where immigrants are constituted as a threat to the national security in the West and politics is moving rapidly to the right. While there is nothing inherently wrong with films as escapism, it is also important that directors such as Suo remind us of the inequalities around us which all too often we ignore, caught up in our own personal narcissism. “Sesang” is an extremely accomplished film which situates Jules Suo as one of South Korea’s emerging talents. Her understanding of the craft of filmmaking and storytelling ability as demonstrated by “Sesang” marks Suo out as a director to watch.